Perspectives from a career communicator and business developer. To be really effective at selling professional services you need to leverage not just traditional capture, marketing, and sales staff, but also the efforts of your project staff that interact onsite with the client. 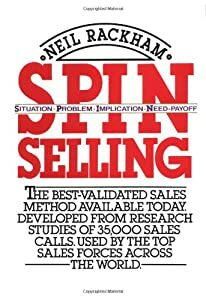 SPIN selling is ideal for professional services firms because the interview technique is especially powerful when used not only during an official sales call, but also throughout the entire sales and project delivery process. Questions are a powerful communications tool. You may in fact already employ this technique naturally. If not in your professional life, certainly in your personal life. For instance, you would like your child to take a coat with them when they leave the house to meet friends at a neighborhood park a mile away. You recommend this and they object. You then may ask, “What will you do if you get all the way to the park and it begins to rain?” This is an example of an implication question. And, as your child begins to think through and even talk through their response, they will likely come to their own conclusion that they should in fact bring a jacket along. This example may seem trivial, but the same principles hold true in client conversations. My recent APMP Journal article, “How to SPIN More Awards Out of Thin Air,” uses real world examples, from the Federal space, of employing SPIN questions to uncover and develop client needs at various stages of the government sales lifecycle. Previous postWEB MARKETING: Build it and they’ll come – Not on your Life!